Tell me I’m not the only one!!! 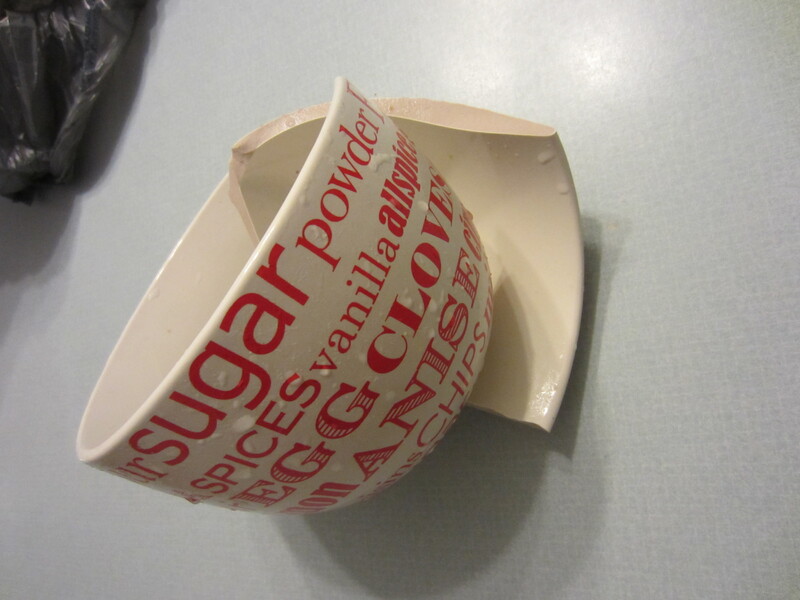 I am going to start telling you about some “kitchen fails” that I’ve had in hopes to let you know that you are not the only one making mistakes of all kinds in the kitchen….and in hopes that you will tell me some of your fails so I can not only share them, but know that I’m not the only one either….right??? My first one may not seem like a big deal, but I broke my favorite bowl! There were two other bowls in the set and I’ve managed to only keep one in tact (for now)! I was washing it and it slipped out of my hands and broke, not shattered, one nice clean break. Now I see why people have those plastic pads at the bottoms of their sinks, it saves their dishes from people like me! I would have tried to salvage it but I use it mostly for mixing eggs, crumbles, and other “small dose” types of things. I figured dried glue flaking off into everything I ate wasn’t my idea of good eats. p.s. I only have 2 glass cups left out of my set of 8 and 1 left out of my set of 6. I wish I could blame my kids!